Frozen berries are blended with hearty oats, chia seeds and spinach leaves, bringing you a nourishing and delicious breakfast smoothie! A quick breakfast that you can whip together in less than 5 minutes. Remember life as a teenager when your parents would pay you to do things in the likes of taking out the trash, vacuuming the living room or painting their nails for $5? What did you buy with those few bucks? A Pokemon card? A bag full of sour apple belts from the Sweet Factory? Or did you do as I did and blow it all on a huge Jamba Juice?! Yes, Jamba Juice. Many summer days spent guzzling down a 24oz monster size smoothie of fruity goodness. Just the act itself of going up to the cashier, ordering my signature Razzmatazz (I mean, there really were only two camps: either you were camp Razzmatazz or Mango-a-go-go) and paying with my own hard earned cash made me feel like I was as cool as my older sister. Yet in-lieu of all the closed Jamba Juices (goodbye to an era) and in light of realizing just how much sugar was in one Razzmatazz, I've gone ahead and made a grown-up version. A breakfast version to be exact. Frozen berries are blended with hearty oats, chia seeds and spinach leaves, bringing you a nourishing breakfast smoothie! 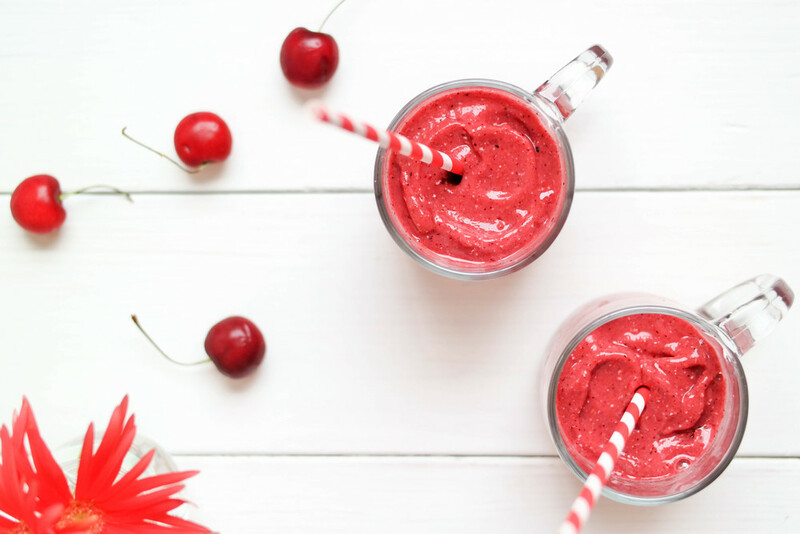 On those mornings where all you want to do is continuously hit snooze this smoothie is a winner. Relying only on your blender, just throw in all the goodies, blend, pour and take with you out the door. Recreate your own Razzmatazz or Mango-a-go-go by adding frozen mangoes instead of berries. Personalize your smoothie and add whatever grains or superfoods you fancy. Three minutes later you have a filling breakfast, quickly lifting you from your morning stupor. Simply blend all the ingredients into a blender until smoothie and creamy. Place in a mason jar or cup and take with you on your way out the door! Enjoy and be sure to tag me so I can see how you make your creations! #8thandlake.